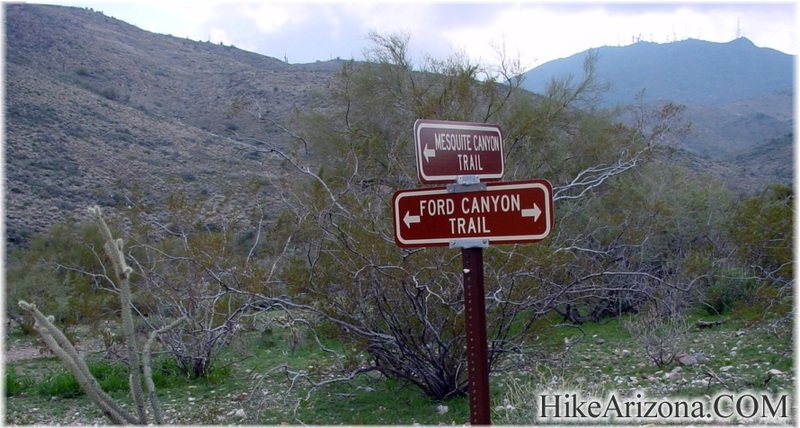 2008-04-27 update by RGandSGP: There have been significant changes to the Mesquite Trail (MQ) since Joe Bartels writeup in 2001. The Mesquite Trail starts at the horse staging area. 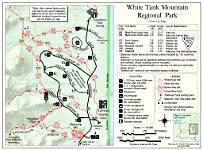 This is located on the East side of White Tank Mountain Road at the junction of WTM Road and Waterfall Canyon Road. This is NOT the normal departure point for hiking the MQ trail. 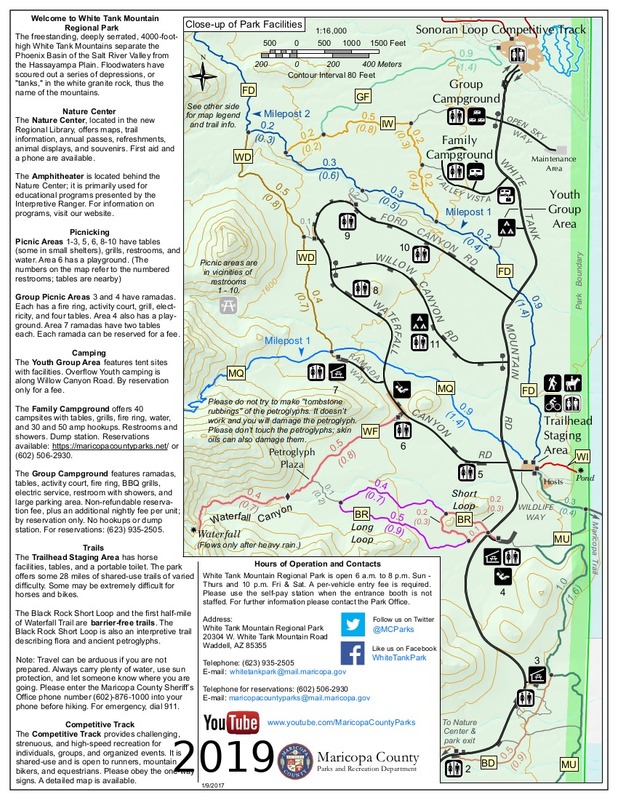 The usual starting point for hiking the MQ trail is at Ramada No.7, which is located at the end of Ramada Way, which in turn is just about 100 yards past the Waterfall Trailhead on Waterfall Canyon Road. Starting at the Ramada No.7 TH it is about 0.9 mi. until you reach the point Joe calls the Goat Camp Junction. That trail (Goat Camp) is now closed and has been for the 5 plus years weve been hiking the MQ trail. The MQ trail angles at that point to the right and continues on until 1.8 miles from the TH. At this point you are at the junction of the MQ trail and the Willow Canyon (WL) trail. Continuing on the MQ trail you will experience a totally new section of the MQ trail. The final portion of the new trail was opened on or about the 1st of April 2008. From the TH of the MQ trail up to the end of the MQ trail is 4.2 miles, as noted on the trail markers. 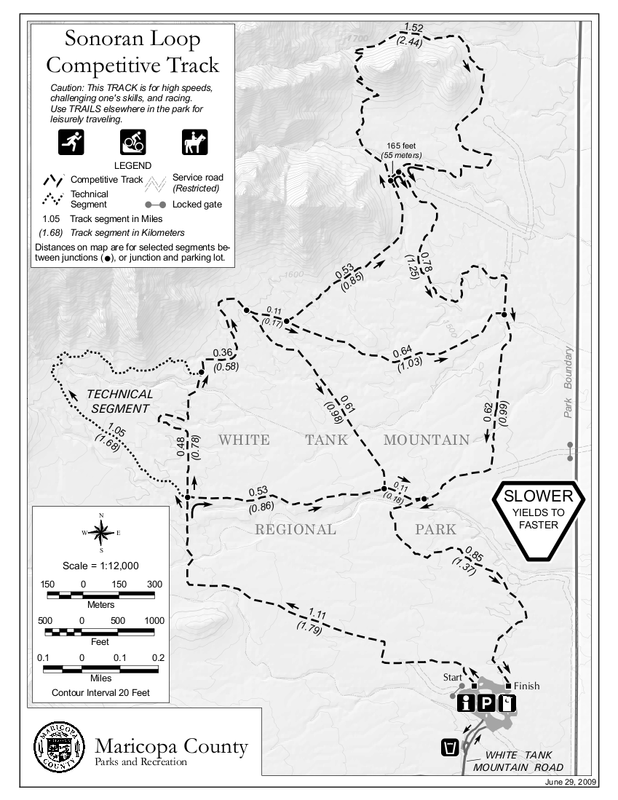 The elevation change from the TH to the high point of the trail is approx. 1375 feet. The end of the MQ trail is at the newly relocated intersection of the Goat Camp, the Mesquite and Ford Canyon trails.An invigorating approx. 8.4 mi (depending on whose GPS you are quoting) hike would be to loop around from the MQ trail to the Ford trail (approx. 0.9 mi of it) and then back down the WL trail joining up with the MQ trail and back down to to your car at the Ramada No.7 TH. Hike: A nice stroll through the desert makes up the beginning of this trail. Check out the views to the right (north) going in. Gently working it's way into the canyon, the trail makes a subtle ascent. The trail gives way in sections to very small boulders. A little further than a mile into the trail comes Goat Camp junction. 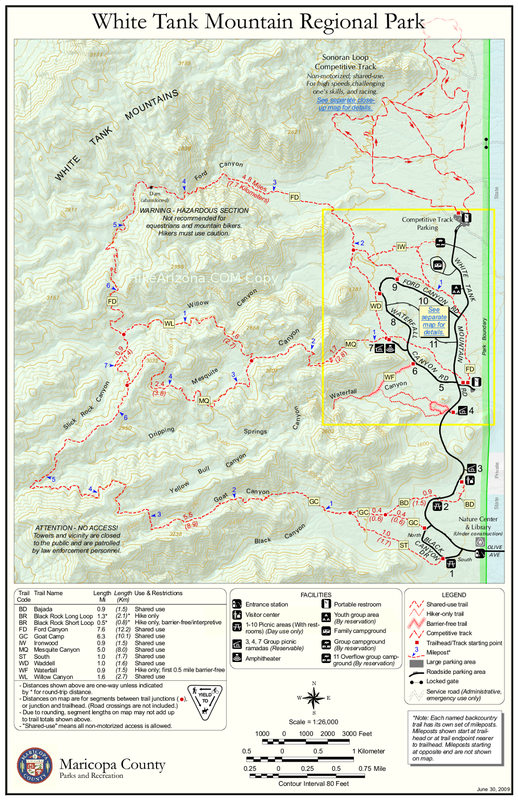 According to map, Mesquite Springs is on the left a short distance up the Goat Camp Trail. As of this writing I haven't personally seen the springs. From the junction go right and up the hill to stay on the Mesquite Trail. The trail continues over a small saddle. 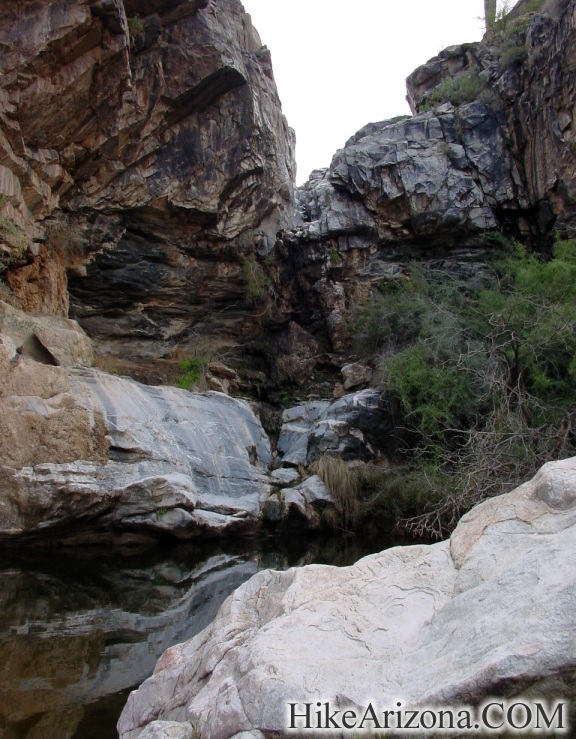 Now heading deeper into the White Tanks, peace is easy to find. Continue on to the Ford Canyon junction. About a quarter mile before the junction comes Willow Springs. It's a short venture off the trail, but very easy to figure out. A small waterfall stands behind a good size swimming hole. Looks to be mighty refreshing for ninety degree weather. I opted to stay out in January! Also appeared to be a little stagnant. I'd recommend waiting for a good rain to was it out a bit. I'm not sure how far Willow Springs lies beyond the falls. Since off trail travel isn't allowed, I guess I'll never know either. You have three options from the Ford Canyon Junction. The easiest would be to head straight back on the way you came for a 5.2 total mile adventure. I recommend turning right (north) and following the Ford Canyon Trail back to your car. This is a 7.7 mile loop total distance and took me about five hours. If you do this loop in this direction, please note: When the Ford Canyon Trail goes into the streambed. You need to travel east and down the wash. It's about a mile ( I think ) of non-trail travel over sections of smooth white granite. There's a very distinctive sign leading you back onto the trail. Okay, your third option would be turn left (south) and follow the Goat Camp Trail back to your car. I haven't done this yet. It's on the list. It's about a 10.2 mile loop. One downer is you have to follow about 2 miles of park road at the end. I'll be doing a bicycle shuttle myself when I do it. Now the real story...lol! I was lost on a counter clockwise loop hike starting at Waddell / Ford Canyon. Instead of coming out to the Mesquite Trailhead I ended up midway in the Waddell Trail. In all honesty it was a little disturbing (scary). Some minor down climbing was necessary, but not too bad. The scary part was looking ahead. The creek dropped without notice. I'm talking ten to forty foot drops, not the kind of bad steps you want to take. The smooth white granite was beautiful. That wasn't the problem. I just wasn't sure if I could backtrack if needed. Especially considering I was fairly tired and it was like six miles back to where I started. Then the sun seemed to be in the wrong place. I started doubting everything, including common sense. I had to be heading in the right direction. It wasn't like I made any 180 degree turns. On top of it all, I kept getting phone calls from employees. Then finally, I spotted the mountain that overlooks the Waddell Trail. I debated including the photos below. Do not hike/scramble here! It's against park rules to venture off the trail. On the same token, it would be nice if the trail was defined enough so this didn't happen. Once again, this happened running the trail in the opposite direction. I started at Ford Canyon and did a backwards loop. 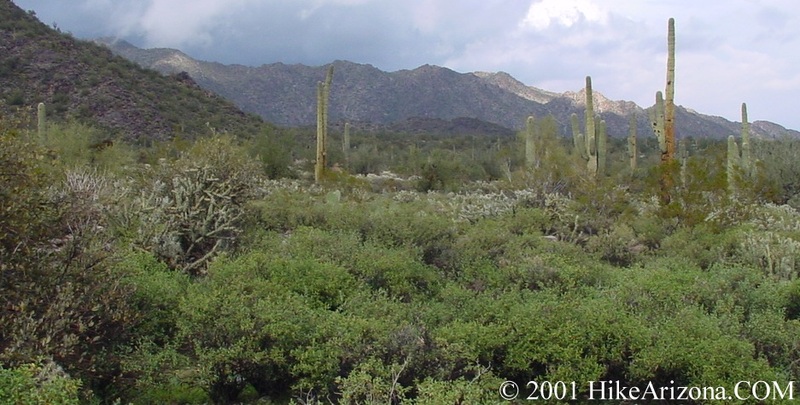 You shouldn't have any problems if you start at the Mesquite Trailhead and go clockwise. 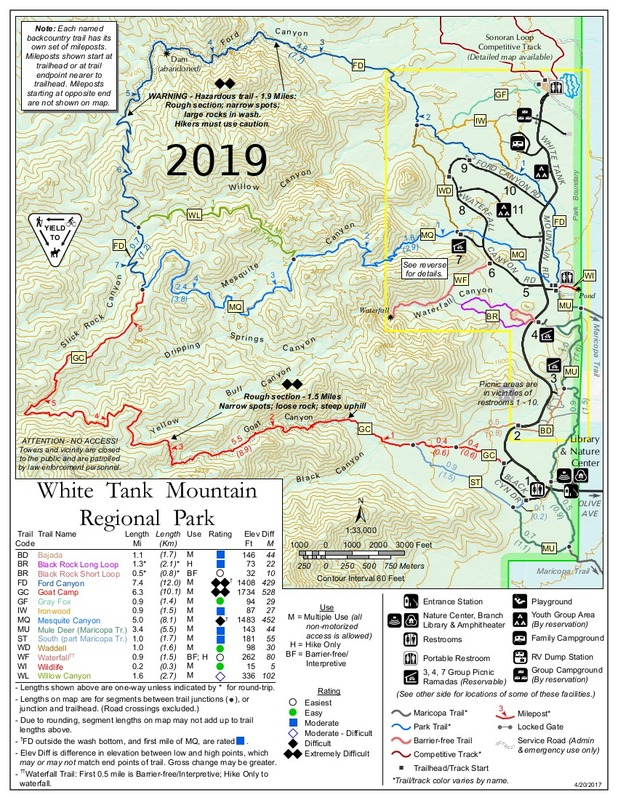 (may be outdated, for now get directions at the information center) Continue into the park on White Tank Mountain Road. Passing the information center at about 1.2 miles. Continue on to Waterfall Road. Pass the Waterfall Trailhead. Pass the playground. Pass the Mesquite / Waddell Trailhead. Be on the lookout for a small parking area for the Waddell Trail to your left. 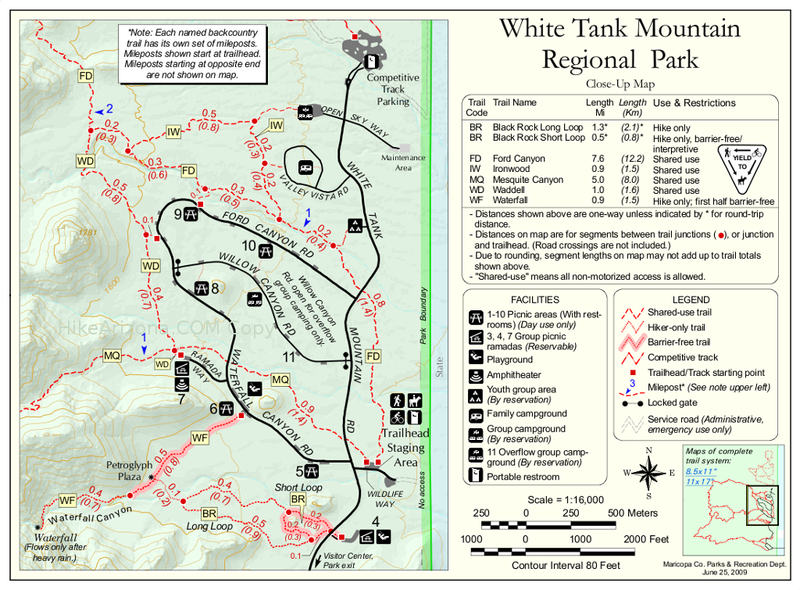 If you come back out to White Tank Mountain Road you need to backtrack.